Manchester United earned a shock last-gasp 2-1 win over Juventus in the Champions League on Wednesday night. United produced a comeback almost as stunning as Cristiano Ronaldo’s volley to secure a late win that will live long in the memory. A fortnight on from being wholly outclassed by the perennial Serie A champions at Old Trafford, the notable improvements made by Jose Mourinho’s side looked set to be undone by a moment of brilliance. Ronaldo’s volley will be replayed again and again, but it counted for nothing as United dug deep to produce a famous late comeback, despite recording just three efforts on target. Juan Mata’s sumptuous free-kick hushed the Juventus faithful and Alex Sandro’s late own goal secured a win in Turin that breathes new life into the visitors’ Champions League campaign. Mourinho certainly enjoyed the victory, going onto the pitch at full-time and cupping his ear to jeers from the crowd. A fitting end to a mad evening. United could scarcely have wished of better preparation for Sunday’s derby clash at swashbuckling Manchester City as the headlines were snatched away from Ronaldo. 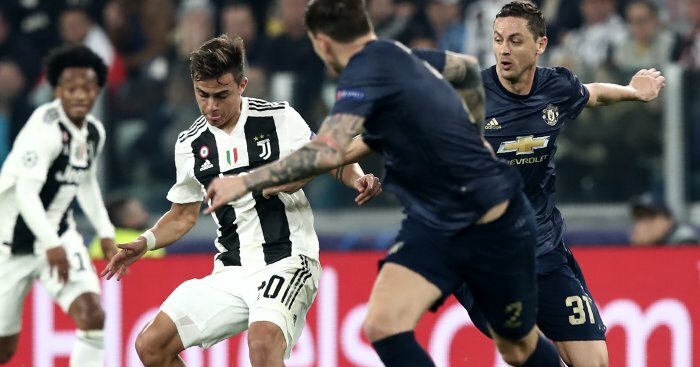 Sami Khedira and Paulo Dybala hit the woodwork either side of half-time despite United’s improved display, which looked like it would be undone by their former hero meeting a Leonardo Bonucci clipped pass with an astonishing volley.